Help transcribe the Pentagon Papers for Sunshine Week! It’s Sunshine Week! While every day is a celebration of information access at the National Archives, Sunshine Week is an annual nationwide event celebrating freedom of information and open government. To celebrate, we’re hosting a special citizen archivist mission focusing on transcription of the Pentagon Papers, starting today! The Pentagon Papers, officially titled "Report of the Office of the Secretary of Defense Vietnam Task Force", was commissioned by Secretary of Defense Robert McNamara in 1967. In June of 1971, small portions of the report were leaked to the press and widely distributed. Visit the Citizen Archivist Dashboard for more information and to get started transcribing. You can learn more about Sunshine Week in our email newsletter. Re: Help transcribe the Pentagon Papers for Sunshine Week! Great post and photo. 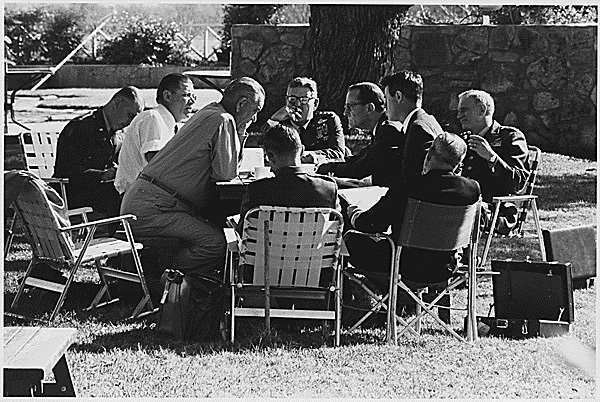 Take note of the one general to the direct right of LBJ with a stick supporting his foldable chair... That's American ingenuity at its finest.